The Pacific War Online Encyclopedia: Auchinleck, Claude J.E. Imperial War Museum. Via Wikipedia Commons. Auchinleck, known to his men as "The Auk," was born to a Scots-Irish military family. Educated at Wellington and Sandhurst, he was commissioned in the Indian Army and fought against the Turks during the First World War, reaching the rank of lieutenant colonel. He continued to serve in India, commanding units of Punjabi troops, except for brief periods attending the Imperial Defense College and teaching at various staff colleges. He was involved in operations against Afghani tribesmen in 1936. Auchinleck was brought to England to command the expeditionary force against Narvik, but returned to India after the evacuation of Allied forces in Norway. In June 1941 he was selected as commander in chief in the Middle East, but eventually lost Churchill's confidence for failing to attack. Auchinleck apparently felt that he lacked both adequate resources and a capable field commander for 8 Army. Following the fall of Tobruk and the First Battle of El Alamein, he was relieved and returned to India in July 1942. 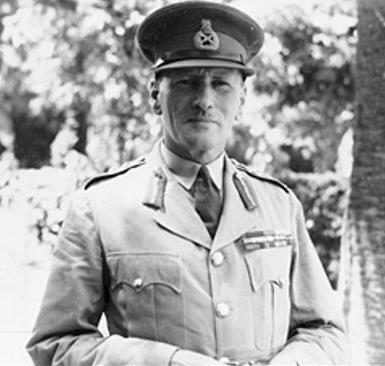 Auchinleck became commander in chief in India in June 1943 and was promoted to field marshal in 1946. He attempted to appease Indian nationalists by pardoning four former officers of the Indian National Army who had been convicted of treason. He was opposed to the plan to partition India. Auchinleck is described by Boatner as "Tall, athletic, notoriously monosyllabic, but with a highly original military mind." He was a strong proponent of the use of combined arms. Slim said of him that "the 14th Army, from its birth to its final victory, owed much to his unselfish support and never-failing understanding. Without him and what he and the Army in India did for us we could not have existed, let alone conquered" (Marston 2005).